Here at Cartoons On Film headquarters, I’ve been busy handling the outcome of recent projects (such as this past summer’s Cartoon Roots: Bray Studios Blu-ray/DVD, as well as working with some colleagues to make progress with a few new ones, such as the upcoming Cartoon Roots release featuring a selection of historic Bobby Bumps cartoons. While all of this has been keeping me quite busy, however, it hasn’t stopped yours truly from continuing to organize and host one of New York City’s recurring and itinerant underground film series: The 16mm Cartoon Carnival! 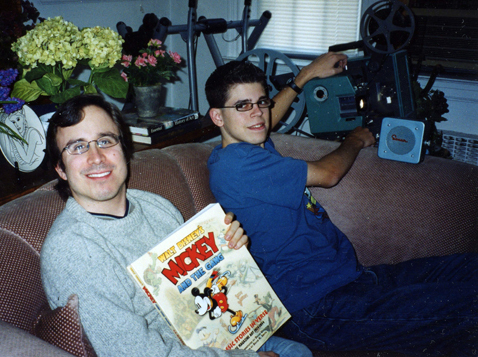 When I first began seriously collecting 16mm prints as a preteen, the main idea was to find and be able to watch cartoons that were not available on home video…or not known to exist outside of a few other archival or collectors’ holdings. Making a dedicated effort to seek out these films was no easy task — I was looking mostly for silent-era cartoons, which are rare to begin with, and it was extremely difficult to do so as a kid with no money. When others shoveled snow for pay or got some cash in their birthday or Christmas cards, those kids might go out and buy video games. I was scouring eBay for the next obscure 16mm Felix the Cat or Out of the Inkwell I could possibly find (and hopefully be able to afford!). This labor of love has paid off in many ways. Over more than a decade and counting, I’ve been able to build the sort of archive that I wish was around when I first started researching early animation. In creating such a comprehensive collection, which continues to grow, I’ve also had the wonderful opportunity to acquire not only cartoons which are not known to exist in more than 2 or 3 copies worldwide, but also some films that may very well be the only known copies at this time. Films of this caliber may not turn up often, but I’ve learned that many rarities and lost films do have a chance of being found. 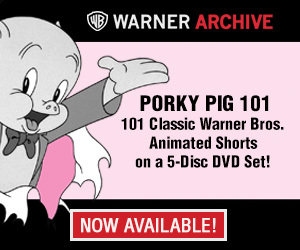 Some of you longtime Cartoon Research readers may remember past posts of mine which advertised local screenings of these ancient archival shorts. 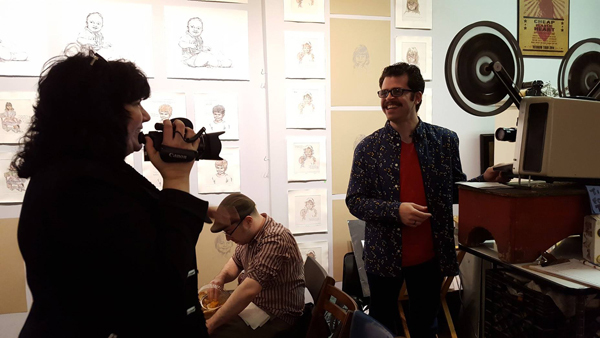 The animated cartoons I work with were originally made to be seen by general audiences, so a few years into my own collecting, I decided to begin sharing these films once again through local New York City screenings. Originally billed as “The Tom Stathes Cartoon Carnival,” this ongoing series is now in its 7th year and we’re coming upon a significant milestone. 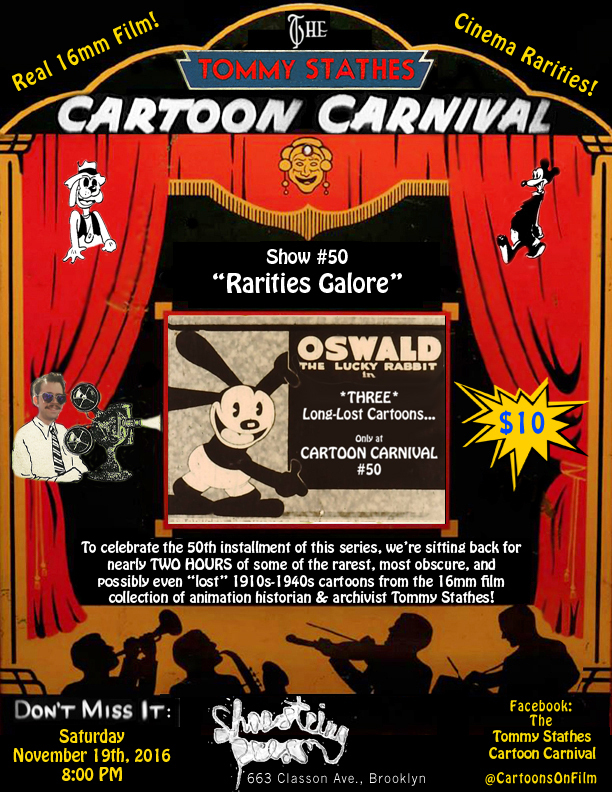 The *50th* Cartoon Carnival, which commences at 8pm on Saturday November 19th, 2016 in Brooklyn, is specifically dedicated to rarities. Our show at Shoestring Press will feature some of the rarest holdings in the Stathes Collection (including some items from the sound era!) as well as a couple goodies on loan from the David A. Gerstein film print collection, which is technically on deposit at the Stathes Archives. Incredibly rare Felix the Cat? Check. THREE nearly-unique Oswald the Lucky Rabbit cartoons? Yes. A couple early Talkartoons most people only ever dream of seeing? We’ve got ’em. On ‘reel’ 16mm film, too. That’s why you should attend if you’re in the New York City area. If you’re not in the area, perhaps the Cartoon Carnival can one day travel out to your locale? Stranger things have happened, such as lost films resurfacing. “Spree For All”? Ya-hoo! Mountain Dew! I wonder if it has the Paramount titles? The 1940’s cartoons of Barney Google & Snuffy Smith were made for Columbia. This was a rare, Paramount one-off. A Jerry Beck holy-grail-lost title for many years. Likely as this short was never included in the U.M.M television sale. Can you please upload this on youtube please. This delicate, yet B&W run down print of Spree For All, looks like it definitely came from a typical private collection for sure. Inferring from what I’ve heard from private collectors, they’re usually picky about what can be seen by the public depending on it’s value. That would mean if you uploaded it to YouTube without consent, that would be an act of ratting out the owner of the print itself! Plus, time is money and not all people have to listen to your demands. 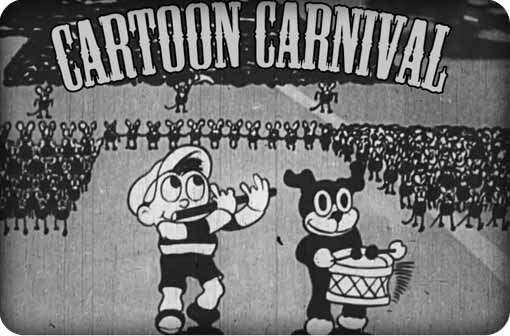 It’s best that you go to the Cartoon Carnival yourself and record the screening if you wanted to show it to your friends, though I’m not sure if you would get prosecuted there for secretly having a camera. 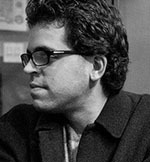 I, too, keep hoping for the impossible, but my impossibles are all from the sound era (and many from Warner Brothers), but I believe that someone owns quality prints out there, with title cards, full credits etc. Congratulations to Tom Stathes for doing an incredible job premiering these amazing older cartoons to new audiences. I’d really love to go, but I’ll be in California attending CTN. If I didn’t have this film shoot to do, I’d be at that screening in a heartbeat. Hope ya have fun! Well hey. The common thread here seems to be, I’d love to come but it’s just too far. And for your part, you’d love to make it possible for fans outside of Brooklyn to see this show, but, well, you have a life to live. But if perchance it would interest you to put this presentation on the road, like an actual carnival, could it be discussed? I live in Boston, and the Harvard Film Archive in Cambridge does a lot of esoteric programing both on and off its published schedule. And they eat 16mm for breakfast – metaphorically that is. If the idea of entrusting valuable prints to strangers is a concern (and it ought to be) maybe setting up something with a trusted outfit like HFA would make it potentially attractive. I know people over there, so if this idea sparks an interest, let me know and I will get you connected. Thank you, Tommy; it was an excellent screening with TWO breathtaking Fleischer Studios elements. Delightful. I wish I could have gone to this, but I live somewhere else.